Finalist 2014 Sir John Sulman Prize! Dallas’ recent body of works include the Winged and Opalescence series. Her detailed paintings are joyful, uplifting pieces which light up their surroundings, and are an expression of the exhilaration she finds in her core love of nature and its link to humankind. Her works are acclaimed and recognised for her luscious use of sweeping impasto brushstrokes and layered textural content. Birds are a part of Dallas’ life and have defined her most recent body of work. The humans who share the space in these paintings are always in black and white – hand stippled by brush to accentuate the strongest characteristics – whilst the birds are pure forms of natural, saturated colours rendered in thick, luscious brushstrokes to sculpt the flighted forms. Brilliant hues radiate from angled feathers, catching the light. These paintings exude love and trust, intelligence and purity, resourcefulness tempered with cheeky playfulness. Dallas’ interest in the enriching bond between animals and humans also encompasses the acknowledged care for these lives. Her careful consideration of the supreme beauty of these birds is tempered by the awareness that some of these species are fast losing their space in their habitats – “From the sublime to extinction”. Dallas has exhibited her works in Australia, Hong Kong, China, Fiji, and the USA. She has been a selected finalist in several prestigious art awards exhibitions around Australia, including twice for the Sulman Prize at the Art Gallery of NSW, and for the Fleurieu Art Prize, the Blake Prize Director’s Cut and the ANL Maritime Art Prize amongst others. The Perc Tucker Regional Gallery in Townsville selected Dallas’ portrait painting of Christine Anu, the singer and actor, as a finalist in the Xstrata Percival Portrait Prize, and the gallery acquired this work for their permanent collection. 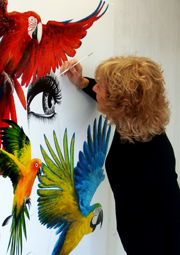 Her works are held in corporate and private collections in Australia and internationally. Dallas graduated from the Sydney TAFE Randwick College with a Diploma of Graphic Art & Design, and went on to become Art Director and Creative Director at a number of profiled Sydney advertising agencies. She designed, wrote and directed press, print and television advertising for clients including Holden, Breville and Max Factor and would also design and paint fine art illustrations for packaging and advertising for Faberge perfumes amongst many other clients. Dallas had simultaneously been involved in fine arts, and she began painting full time to follow a career in painting. Dallas has been known for her paintings from the Traveller, Oceanscapes and Immersion Series since 2000. The Traveller Series and the Immersion Series were easily recognised by her layering of heavy impasto - often scraped through with sand over an imprimatura run with vibrant colours - and her new Winged Series shows evidence of their influence as she creates multiple textured elements within these new works. “Also in the Sulman Prize is Dallas Bromley’s revolutionary “The morning after – the party’s over”, which is done in what I learn is a signature style. This is compulsively Romantic, genre-based and determinedly figurative.” - The Happy Antipodean “A timeless journey of tantalising textures” - Grant Wolf – Writer, actor, entertainer. From her first exhibitions in Paddington, NSW, Dallas has been represented by Valerie Cohen Fine Art, House of Phillips Fine Art and Rushcutters Bay Gallery in Sydney, The Jackman Gallery and Art Nomad in Melbourne, Art Galleries Schubert and David Hart Galleries in Queensland, LK Galleries in Perth, The Salamanca Collection in Tasmania, and Bark Modern Art in Hong Kong.